Is Square Heading For A Rough IPO? Square has a noble vision which is to enable anyone with a mobile device to accept card payments. They are democratizing commerce and leveling the playing field for sellers of all sizes. Today, millions of sellers now accept Square and the company is quickly extending their core offering into various other marketing and financial services. The market opportunity for Square is massive. Of the 30M local businesses in the US which generate about half of all private sector output, 20M of them do not accept credit cards. 30% of US purchases are still made with cash, checks or money orders! Commerce is increasingly becoming digital and mobile and so Square is riding that trend. Just last year the company processed over $20B of payment volume. How Does Square Make Money? 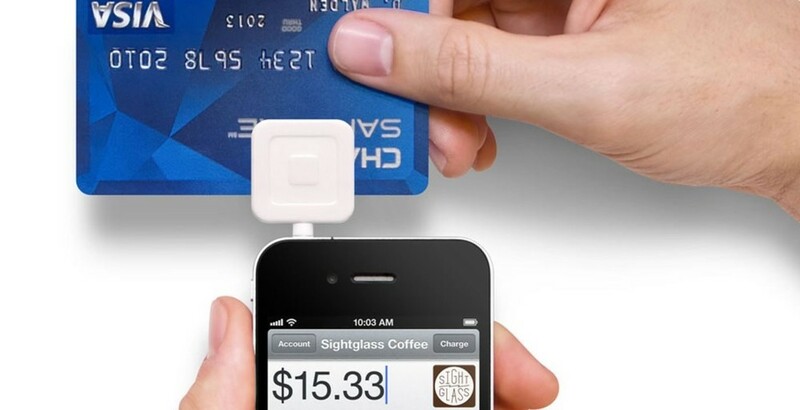 Square charges a 2.75% flat rate per card swipe, or 3.5% plus $0.15 per transaction for manually entered cards. Beyond their card dongle, Square also offers online payments, a P2P service called Square Cash, and a point-of-sale system called Square Register. I won't get into how payment processing actually works in this post since it's quite complicated but the below image gives you a quick sense for where Square sits in the ecosystem. 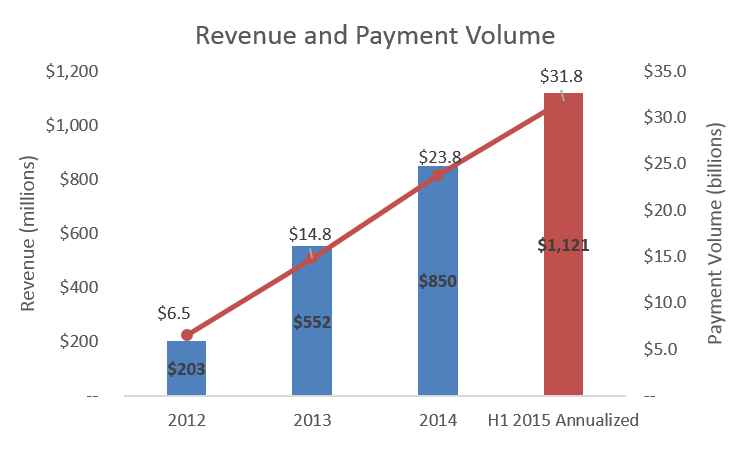 In terms of payment volume, Square grew 60% in 2014 and is currently tracking towards 50% growth this year. They did almost $24B in payment volume last year and will likely do somewhere in the $35B range this year. That translates to $850M of revenue for last year going to approximately $1.3B this year. Virtually all of their revenue is from payment processing. Starbucks does make up a meaningful chunk of revenue but it is a poorly performing area of the business that will likely go away over time. So what's wrong with the Starbucks business? The below chart shows the gross margin for the overall business. As you can see, Square has 29% overall gross margins, dragged down by the negative Starbucks gross margins. Looking at the payments business alone (less Starbucks), the business operates at a healthier 37% gross margin. The company realized that this doesn't look great so they went ahead and made some adjusted non-GAAP metrics to shift investors attention, namely adjusted revenue and EBITDA. 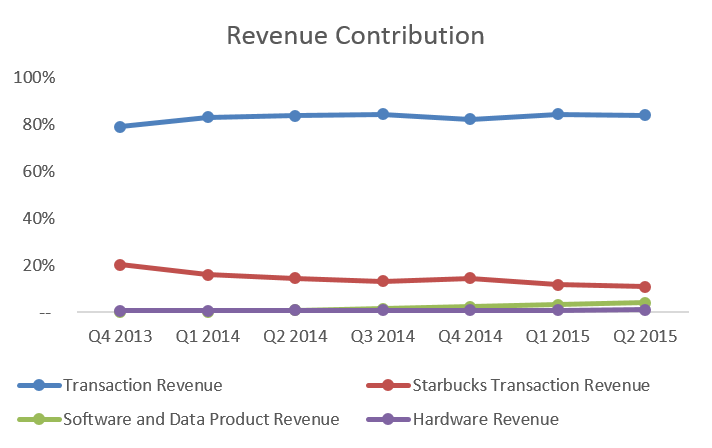 Adjusted net revenue is just total net revenue less Starbucks revenue and transaction costs, which is basically a "true gross margin". 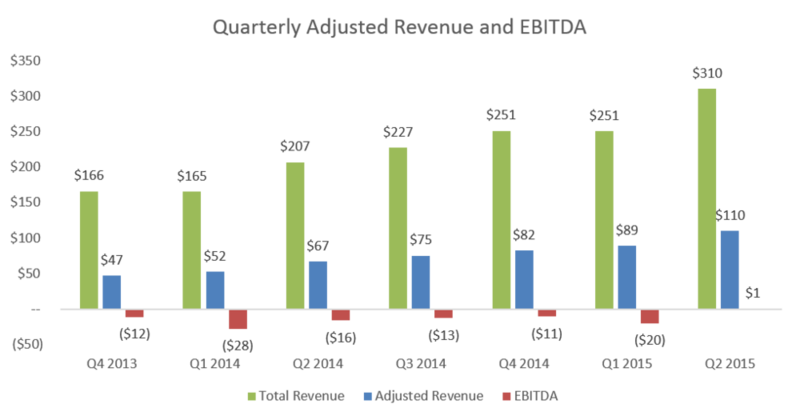 For EBITDA, they took their net income and added back all the usual non-cash items such as stock based comp, depreciation and amortization and interest income, but they also stripped out Starbucks to further improve the number. Square did about $200M of adjusted revenue ("true gross margin") in 1H 2015 and managed to turn a small EBITDA profit in Q2. Moving onto operating margins, Square has historically generated large operating losses. They lost $85M in 2012, $103M in 2013, $150M in 2014, and a similar amount in 2015 if you annualize their 1H 2015 numbers. This is quite atrocious, but again, removing Starbucks does help a bit. These large operating losses do not translate directly into cash burn on a 1:1 basis. Since there are large depreciation and amortization expenses from equipment sales, stock based compensation expenses and provisions for transaction losses, the actual cash burn is lower than what is indicated by the income statement. 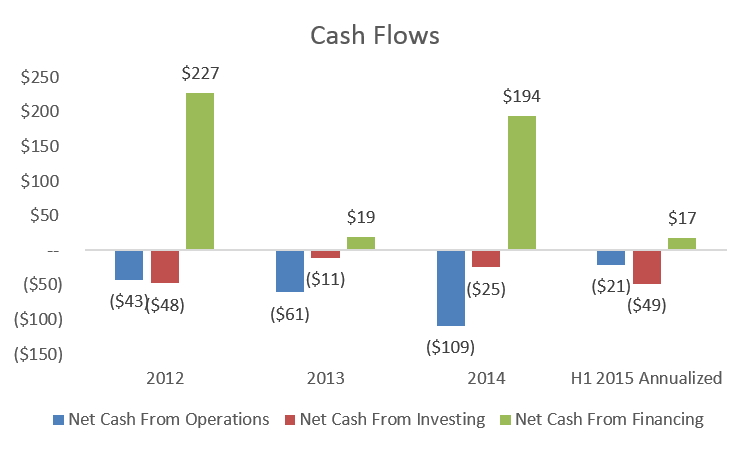 In the first half of 2015, a $74M operating loss only translated to an $11M reduction in cash from operating activities. Still, after factoring in capex and other cash flows, the company is still burning between $4-5M per month. Not great but far better than cash burn from years prior. So what's Square going to be worth at IPO? Well, PayPal recently spun off from eBay and is currently worth $41B based on $10.7B of revenue and $2.8B of EBITDA in 2016. It's a modestly growing business with extremely healthy margins (26% EBITDA) and trades at 3.5x 2016 revenue or 13.2x 2016 EBITDA. Meanwhile, per the below chart, PayPal is comped against some large cap internet comparables as well as card networks (Visa, Mastercard) and payment processors (Global Payments, Vantiv). Large cap internet companies trade at 6-7x forward revenue, card networks at 10x forward revenue, and payment processors at 3.5-4.5x forward revenue. Card networks trade at very high multiples because they are cash cows with 60-70% EBITDA margins. Square can never achieve those levels because a large part of their transaction revenue needs to be paid to these very card networks. PayPal is also much more inherently profitable than Square because 40% of their payment volume is ACH which has much better margins than credit cards. So where does that leave Square? Unfortunately, Square is nowhere close to generating significant profit. My guess is that over time they can trade like a high volume payment processor. However, the ones listed below have more attractive financials. Interestingly, another payment processor, First Data, just went public this week. Despite doing $12B of revenue (10x the size of Square) and generating healthy EBITDA (34% margin), First Data's IPO was rough and they are worth just $14B, a far cry from the $29B where KKR purchased it. However, the business is not really growing and is saddled up with debt from the private equity deal which is why it's not trading like other payment processors. Perhaps Square will trade somewhere in between all of these payment processors. That would put Square somewhere in the $2-4B valuation range which is FAR lower than their last private round. I'm curious to see how bankers position the company in the coming weeks!